Katy Rhode (74) of Groenheuwel in Paarl East is thrilled to be feeding her friends and family freshly picked vegetables, thanks to the Impilo Household Vegetable Garden Establishment and Grey Water Harvesting Project of the Western Cape Department of Agriculture, in cooperation with the Great Commission Networks (GCN) NPC. The aim of the project is to create 100 household food gardens in the Cape Winelands and Cape Metropole districts. To reward Ms Rhode for her commitment and participation in the project, shes receiving a bicycle as part of a Qhubeka programme to benefit 70 Cape Winelands vegetable garden project participants. The bikes will allow Ms Rhode and others like her to plant and water their gardens and make sure they get their produce to market as quickly as possible, using their own transport. 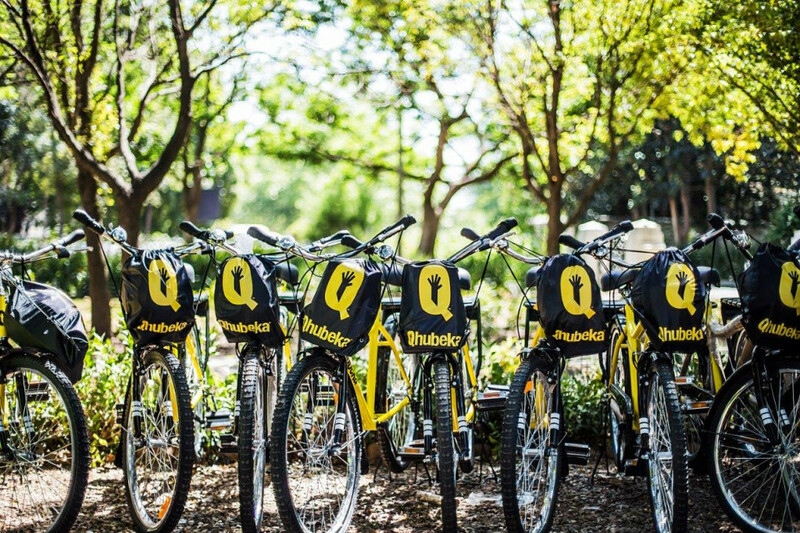 The Qhubeka distribution of 70 bicycles to Cape Winelands beneficiaries is funded by Nederburg Wines, home to Qhubekas bicycle assembly facility in the Western Cape where a number of previously unemployed women from the local community are trained to build bikes for countrywide distribution. Qhubeka is a charity that changes lives with bicycles. Qhubekas programme participants earn bicycles in various ways, for example through learn-to-earn and work-to-earn projects. The aim in this instance is to support the Western Cape Department of Agriculture and GCN initiative, which promotes healthy eating and improved food security amongst marginalised communities. The recipients of the 70 Qhubeka bicycles are from Paarl East, Stellenbosch (Cloetesville) and Franschhoek (Groendal), with the first 20 (from Paarl East) receiving their bikes at a ceremony at Nederburg on 25 October. All the project participants receive a starter kit from the Western Cape Department of Agriculture through Casidra (Cape Agency for Sustainable Integrated Development in Rural Areas). It includes a hoe, rake, watering can, grey water harvesting and irrigation system, organic compost, fertiliser, some vegetable seedlings and seeds. Mr Schmidt says the programme includes not only the elderly but also farmers across the age spectrum, even those in their 20s. For more information, go to www.nederburg.co.za/bicycles and/or www.qhubeka.org.